Here's a long party jumpsuit styled to show off your love of fashion. 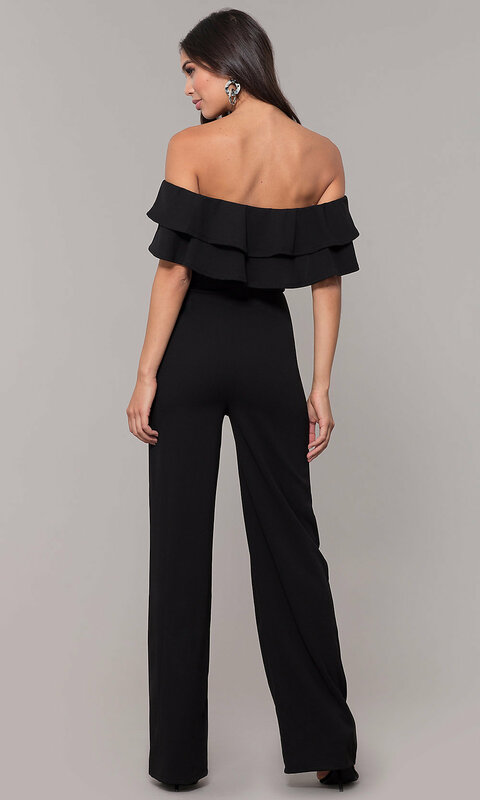 A double-ruffled popover flounce trims the off-the-shoulder strapless neckline on the party-ready jumpsuit for a look that is on-point and chic. Crafted in a spandex-crepe blend, the fitted jumpsuit is an easy-to-wear design. Long wide-leg pants complete the sleek look of this party popover jumpsuit that is suitable for celebrating weddings, enjoying holiday celebrations, or dancing the night away. The model wearing burgundy is 5'9.5" and wearing 3" heels.